Safe Work Australia estimates that work-related injury and disease cost Australia roughly 5% of its GDP (Safe Work Australia, 2012). It is no wonder then that businesses today have a great sense of commitment for their employees, customers, visitors and partners health and safety. A business owner is aware that any accident at the workplace, whether small or big, is a direct cost for the business. Illness and absenteeism can impact businesses too. Most Australian employers know that providing first aid training and equipment for employees can save lives in a number of situations, but do you know what else is required? Compliance with the Work Health and Safety Act (WHS Act) and the Work Health and Safety Regulations is a key requirement for Australian businesses. Hopefully, the workplaces you are responsible for are compliant with the requirements, your employees are trained to minimise the injuries from accidents and to save lives. Having trouble understanding your compliance needs? Let Alsco help you to understand what your responsibilities as a business owner are to ensure compliance. Contact our friendly sales representatives for a quote customised to your needs and a free audit. Under the WHS Act it is the responsibility of the person who is conducting the business to ensure that the workers and other people are not exposed to any health and safety risks which arise due to the business. Business owners have to provide adequate first aid facilities and equipment which can be easily accessed, facilities for them to be administered as well as enough trained people to administer them. So clearly, as the business owner, you are responsible for providing enough first aid kits with appropriate modules, facilities to administer all kinds of first aid as well as adequate number of trained people to do so. It is left to you to determine what is an adequate number of first aid kits or first aid providers and the kind of training they need to undergo. The regulations do not specify what is adequate in terms of first aid equipment and leave that for the businesses to determine. In order to do so, your business needs to do its own risk assessment. Hazards which could result in injury need to be identified and the severity, frequency of the injury or illness associated should be understood. This will help in determining the content of the first aid kits, their numbers and the number of trained first aiders. As a business owner it is required that you do this survey in consultation with your employees or depending upon the situation, with other businesses that are situated in the same premises. What Are Your First Aid Requirements? reviewing your first aid requirements on a regular basis or as circumstances change. How Can You Identify Hazards and their Possible Impact? Certain workplaces have greater risks of injury or illness due to the nature of work or types of hazards present. Further, certain types of work or hazards would be associated with certain kinds of injuries. A person working with animals would be more likely to have stings, bites or scratches while a worker in a chemical factory is more likely to suffer burns, eye injuries, poisoning or skin irritations. While determining first aid requirements it is important to take into account factors such as the number of workplace sites, the distance between these locations, the ease of access to each of the work locations, number of floor levels at the workplace, workers who are located offsite. You need to do this to ensure that all workers at any given workplace have access to first aid. It is important to remember that apart from your employees, your premises might also have visitors such as clients, contractors or students. There numbers are especially significant in the case of movie theatres, hotels, restaurants, shopping malls, entertainment zones. What Should Each First Aid Kit Contain? Apart from the above, the contents of the first aid kit can be determined based on the risk assessment survey done at the workplace. For example, a restaurant would have a larger risk of burns and cuts. Therefore, the first aid kit at a restaurant should carry additional supplies for the above. It should also carry medicines and basic equipment for serious burns. it always contains an updated list of the contents. The contents should be periodically checked to ensure they are replaced and not out of date. the kit should be made of material that prevents dust, moisture and contamination. Automatic Defibrillators can be critical to saving lives in case of a cardiac arrest. In case you have a large number of workers or high risk for cardiac arrest due to say electrocution etc., providing AEDs would be recommended. Eyewash equipment should be provided where there is high risk for eye injuries. These injuries may be because of hazardous substances including chemicals. Portable shower equipment in workplaces should be provided when there is exposure to dangerous chemicals or danger of serious burns. Where Should First Aid Kits Be Located? It is important to be able to quickly access first aid kits location is vital. The kit should be prominently located, easily accessible and retrievable. It is better to locate them closer to the location where injuries are more likely. Standard first aid signs should also be displayed. These will also help in locating the first aid boxes. If your workplace has more than 200 workers, then a first aid room should be provided in order to properly administer first aid. However, in case of a high risk unit, a first aid room should be provided in all workplaces having 100 workers. A first aid room should also be provided wherever it is not possible to administer the first aid properly in the absence of such a place. Why Do You Need Trained First Aiders? First Aiders are a vital part of the compliance for Australian Workplaces. As an owner of a business you need to ensure that there are a sufficient number of people who trained to provide first aid. The training may be provided by Accredited Training Organisations like Alsco. All first aiders need to be trained in providing CPR and treat minor illnesses and injuries. In addition, in high risk areas, sufficient training to apply advanced first aid procedures should be given. And if the workplace is located in a remote or isolated area then the training should should given should adapt to the special needs of such situations. Training once is not sufficient. First aiders should refresh their CPR training every year and basic first aid training every three years. Alsco Training offers a year-round support service to help your business be compliant with the latest WHS Act. How Many First Aid Trained Employees Should You Have? How Should You Develop Proper First Aid Procedures? All first aid treatment given should be recorded and reported to management. This is a requirement under Health Records Legislation. Another responsibility of a person responsible for conducting business is also responsible to ensure that the workplace has an emergency response plan which would include workplace evacuation procedures, notifying the emergency services, medical treatment and assistance and proper communication of emergency response procedures. Should You Regularly Review Your First Aid Requirements? Yes. First aid procedures need to be constantly reviewed along with the workers to ensure they are adequate and effective. Do you know if the number of first aid kits are sufficient, they are accessible to the workers, well maintained and easily identified? Do the modules suit the hazards at the workplace? Are the first aiders adequately trained and up to date in their training? Are there a sufficient number of first aiders and can they be easily accessed by the workers at any given time from all location? These are some of the questions which need to be covered in the review. The importance of having a comprehensive first aid plan with well defined procedures cannot be overemphasized. 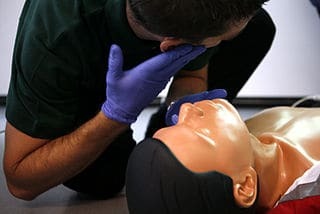 The guidelines laid out in this article are essentially a summary of First Aid In The Workplace . These should help you not only with your WHS compliance but also to reduce the risk of injury and illness at your workplace and the associated costs. How To Get More Help? If you are not sure whether your workplace complies with WHS requirements, remember you can always get free advice from Alsco. If you are unsure of what to do, Alsco can make it simple for you. Delay no more. Review and enhance your compliance now. Call 1300 077 391 Australia-wide. Image licensed under the Creative Commons Attribution-Share Alike 2.0 France license.